Rentable basement maze (subway cars and stations repurposed. Watch for the aquarium!). Or a whole other subway system. Michael Heizer’s City. On google maps. referred to in bldgblog’s Oncecity post. Oh god this is so me. Although I don’t think I could deliver this one, even with the caveats about stupid generalisations. – this last one makes me think about -og(ue) words. I don’t like them ending in -g. Sorry. When you do that they all remind me of dog. 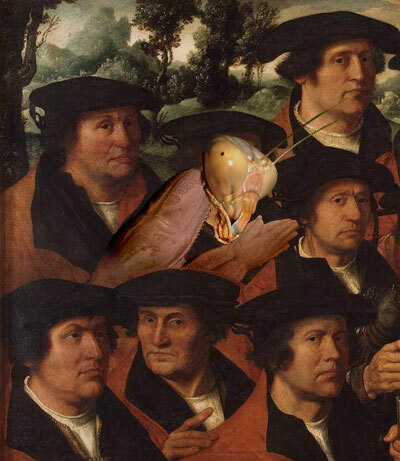 So monolog, dialog, ideolog, demagog and synagog (!?!) all look like they’ve had their tails docked. And then why rogue and brogue and baroque? (don’t quibble, you know what I’m talking about). 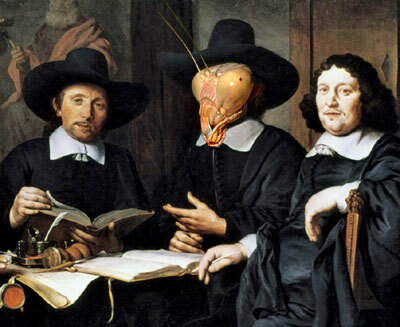 If you really can’t abide -ue on the lot then for these last I recommend roag, broag and barock. Since we know it’s not buroak. Right? season 2, episode 17. In which we finally get to see where Claire was when she was abducted. What’s so great about it? The props cupboard, full of those fakey home-madey Fred Flintstone costumes The Others were wearing when they waylaid Jack, Sawyer et al in the forest and said stupid things about coffee tables. Because it shows that They deliberately set out to present a visual impression of themselves to Our Protagonists as backward forest folk. Or as crazy culty survivalists, when in fact they’re perfectly capable of running a fairly modern looking medical facility and shaving. Why would they do that, when our heroes have already met Ethan and know that Herne-worship is not their gig? I think to implant an idea, no matter how irrational. I suspect, actually, that this implanting was probably the whole reason they decided to reveal themselves to Jack et al at all. Which is another way of saying: some things that seem applicable to concerns about authenticity, roleplaying, old-school sensibilities and Robert E Howard. 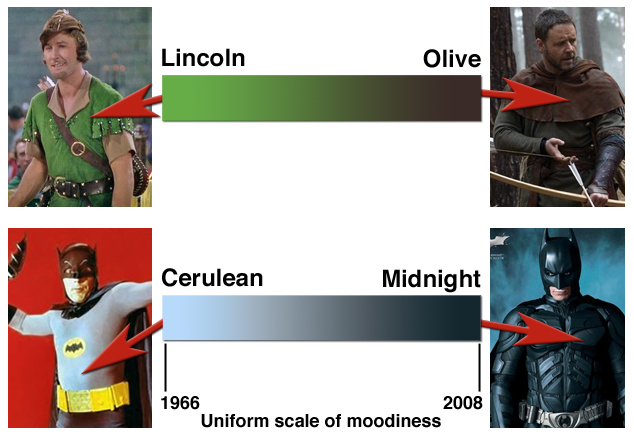 The film reviewer at the WashPo likes his Robin Hood more Lincoln Green and less olive drab. The review is otherwise forgettable, but this point in particular reminds me of James M’s objections to the not-so-creative reinterpretation of iconic characters. James says, in brief, “if you’re not going to do a proper Conan story that respects the character, then don’t call it Conan.” And that seems kinda fair enough, although also kinda a problem for Batman stories, say, where reinterpretation has become part of the character. What I’m intrigued by here, though, is the source of authenticity the reviewer feels is offended. See, there is no Robin canon or literature, really. As a character he predates all his literary treatments, which leads me to think he’s more of a Batman than a Conan, but the WashPo author wants his merry men, his Maid Marion. Some smiling. And maybe some singing. As to whether Robin is now a closet teabagger, I can’t comment, I haven’t seen it. But I thought the knee-jerk right-wing audience were all busy watching Iron Man? an extra-terrestrial “roadside picnic” has left dangerous and incomprehensible materials strewn across a zone of Northern Canada. Although sealed off for scientific research, this zone is raided by “Stalkers” who sell the unnatural trinkets for black-market cash. To do so, they brave bizarre dangers, because the zone has been transformed into a place that is utterly at odds with our own world. The alien is never seen or even described, and all the characters encounter is its terrible remainder: landscape made alien. Pools of jelly that will cripple a man lurk in basements, extra-terrestrial cobwebs that can stop a heart beating are strung across doorways, and gravitational mantraps will crush anyone who passes over the wrong patch of mud. Bldgblog does it again with a Jim Rossignol piece on the Chernobyl zone in computer games. Here authenticity comes with a side of carcinogens. Which leads me to the thorny problem of demihuman longevity. Having spent last week paddling about in environmental history it occurs to me that a Really Interesting fantasyland would be one where elves and dwarves might “naturally” have very long lifespans, but in practice they don’t get to realise them because of the massively toxic/dangerous environment – they were all fished out during the last Awesome Magical War so that now only juveniles are left. Except, of course, for a couple of secretly rawkk guys hiding out in deserts and swamps waiting for the right apprentice to show up.